Sussex Tristars is run purely by volunteers. The membership fee and weekly charge received, along with any other donations and sponsorship, is used to pay for the facilities that we use, for the coaching equipment, Triathlon England club membership (and insurance), DBS checks and for the continued coaching and welfare education of these volunteers. We are very lucky to have a superb team who dedicate their time completely free of charge to the club. Each one of the committee members and coaches is DBS checked and mentored by a more experienced coach. They all love the sport and love coaching and looking after children. We are always on the look out for more volunteers to help when the Team's own family commitments conflict with training sessions so if you would like to get involved, please just have a word with any of the coaches or email info@sussextristars.org. Whilst a lot of children come to triathlon because of their parents, with Paul it was the other way around. His daughter, Jessica, has been at Sussex Tristars since 2011. After a few niggling injuries from long distance running, Paul decided it was time to see what all the fuss was about and needing a new challenge after the Brighton Marathon in 2014, decided to enter a triathlon at the end of the season. Since Falmer Triathlon in 2014, he joined Brighton Tri club and started training for the 2015 season becoming the “Novice veteran champion”, something that still causes excessive amusement for his daughter. After helping as a parent for a couple of seasons, Paul completed his Level 1 training in 2016 and Level 2 in 2018. Kevin started racing triathlon after the 2012 Olympics, its never too late you know. Taking pleasure from his own training, and still enjoying racing for club and GB Age Group teams, Kevin also enjoys developing the new talent and helps coach, particularly at Sussex Tristars. Three of his children (Johnny, Edie and Grace) are now also keen on multisport and attend the club. He takes pleasure from seeing everyone giving their all, and then coming back for more. Andy has been actively involved in sport for many years, achieving county levels in both football & Golf. More recently he has competed in the Go Tri Pell’s Pool Aquathlon super sprint series, and hopes to rise to the challenge his daughter has set to compete in his first triathlon in 2017. 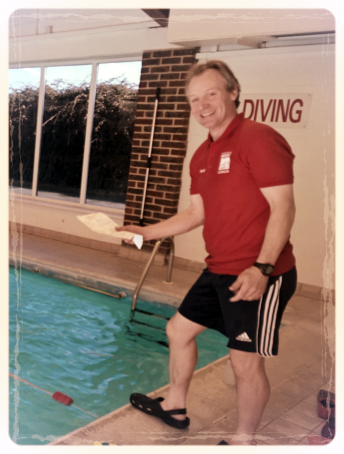 Andy started swim coaching about 6 years ago when his daughter, Rebecca, joined a local swimming club in Brighton. Rebecca also enjoyed taking part in many running events and so it seemed a natural progression to enter her first triathlon. On crossing the finish line, she said ”can I do it again ! !” He realised that triathlons were where her interest lay. Rebecca joined Sussex Tristars in 2013 and since then Andy has helped to coach the swimming sessions and in 2016 gained his Level 1 triathlon coaching qualification. Matt has been coaching and participating in triathlon since 2008. He co-founded Brighton Tri Club and now makes guest coaching appearances to support the great work that the other coaches do. He is passionate about sport and loves seeing the children finish the sessions with a big, yet exhausted, smile still on their faces.